Early into the first round of his first professional fight, light middleweight José Luis Sanchez(1-0), was suckered into trading shots with a fighter far less experienced. After two straight left hooks from his hips the opponent, Guy Youell caught Sanchez and floored him. Sanchez looked over at his father who gave him a Mr. Miyahi-esque look. “Once I got dropped, I finished the round but (my body) wasn’t the same,” recalls Sanchez. He would get back up and drop Youell three times before eventually dropping enough uncontested blows to force the referee to step in and end the contest. “Once I went to the corner I recovered, went back and started using my boxing skills and I knocked him out,” says the 20-year-old. Brawling with a professional boxer and an MMA fighter with a sub-.500 record and 10 years his elder, probably was not the best idea for Sanchez. It was a hard lesson which tested his resilience but he passed with flying colors. Helping him get in shape are his brothers Alan, also a professional boxer with a record of 3-1 and his youger brother Jason, who will be making his professional debut in December. The three are trained by their father José at their home gym is Albuquerque’s Westside. To further his preparation for his second career fight on Saturday October 27th at the Kiva Auditorium, Sanchez has been traveling to Las Cruces, New Mexico where he is training with undefeated Top Rank prospect Abraham Han (17-0) of El Paso, Texas. The middleweight Han, also has a fight the same night in El Paso. Sanchez skills as a sparring partner have even drawn compliments from the Han camp. “I’ve been working hard and for them to say that it felt good,” says a humble Sanchez. On Saturday night, his fight with Angelo Sanchez (0-0-1)–needless to say, no relation– will be the opening bout of a card that is loaded with local New Mexico talent. 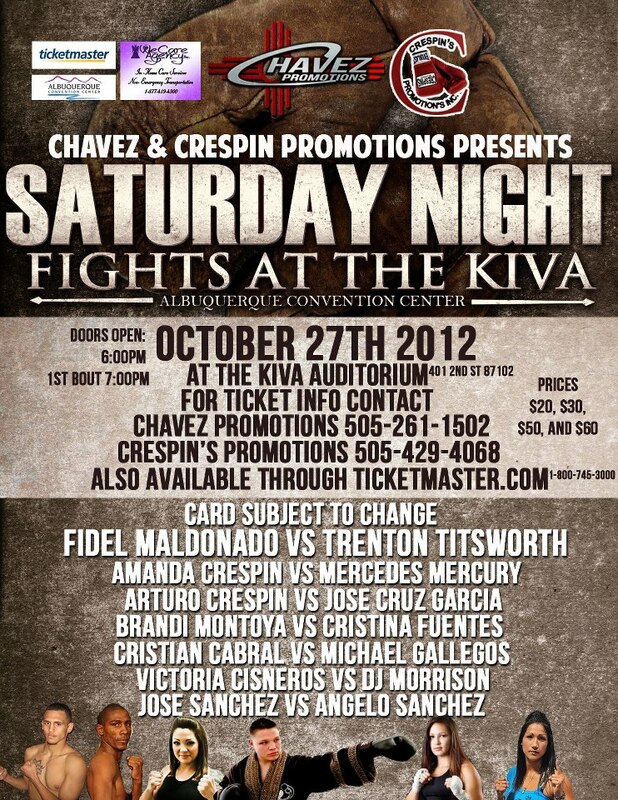 or by contacting Chavez Promotions at 505-261-1502 and Crespin Promotions at 505-429-4068.